Washing Machine Doesn't Drain | What Can I Do? Most of us have a love-hate relationship with laundry. A simple chore can turn into a nightmare when, in between loads, you notice the clothes are soaking wet and water is standing in the machine…the telltale signs your washing machine isn’t draining properly. Don’t let washing machine issues ruin your day, consider some common troubleshooting tips below. Note: before you investigate the problem, always make sure the machine is unplugged! If the washer gives you an error code, check to see what the manual says about the problem. It will provide some insight and next steps, rather than you having to take it all apart and potentially create a bigger mess. If the lid switch is broken, it prevents the machine from draining properly. The lid switch is typically a small switch located under the lid or door of the washer. Open the washer and press the switch. If you don’t hear a clicking sound, the switch may need replacing. If the drain hose is clogged, or it has a kink inside the drain tube, it prevents water from being pumped out of the machine. Remove the drain tube attached to the back of the washer. Do you notice any obstruction? To check if it’s clear, blow air into it or run water through it. If nothing comes out of the other end, there could be a piece of clothing stuck in it. If nothing is obstructing the drain tube, the problem is most likely at the washing machine pump. Find where the pump is located, typically the back or front of the machine. Over the sink, remove its screen in case water comes out. Inspect the pump for cracks or leaks. If the blades are broken or the pump is leaking, you may need a new one. Some washing machines have a water pump belt. If the water pump belt is broken or worn out, the washer will not drain. Refer to your manual to see where the belt is located. If it shows sign of wear, then replace it. 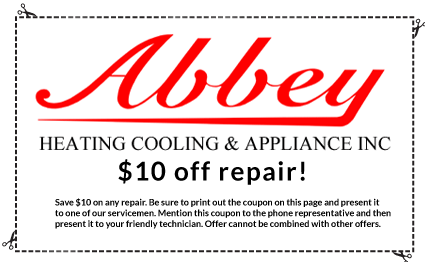 For this or other reliable, same day washing machine repairs in Kansas City, look no further than the expert technicians at Abbey Heating Cooling and Appliance. We have experience working on a variety of washing machine brands including Maytag, Whirpool, and more.